I co-authored a story published in the London Sunday Times today about cracks that have been discovered in WhiteKnightTwo’s wings. The article is behind a pay wall. Sorry about that. It doesn’t go into a lot of specific detail about the cracks, so here’s a bit more information. 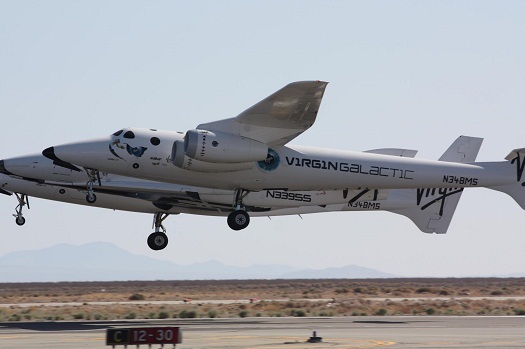 The cracks were discovered during an inspection conducted after Virgin Galactic took possession of WhiteKnightTwo from builder Scaled Composites in February. Sources tell me the cracks are along the spars that run the length of the wings. Specifically, they are located where the spars connect with the fuselage. My sources tell me the cracks have caused quite a bit of concern among the engineers at Virgin and Scaled. One particularly worrisome aspect is that nobody knows why or when they occurred. I’m told there is some comfort in the repairs being made based on previous Scaled experience in patching composites. However, since the cause of the cracks is uncertain and WhiteKnightTwo is unique in terms of its size and the stresses placed on it by SpaceShipTwo, the engineers are in uncharted territory. They don’t know if they have addressed the root cause, or whether the problem will reoccur. This is not an insignificant matter because this is the aircraft that will launch a hot of billionaires and millionaires into space. Virgin Galactic has denied that there are cracks in the wings. The company claims they are adhesive imperfections that have been repaired and have a negligible impact on the aircraft. We stand behind this report. All our sources referred to cracks. Nobody used adhesive imperfections to describe the problem. Should we be giving them a break considering the challenging nature of their venture – or should we be tearing them down for ignoring safety risks, gross incompetence, and a failure to deliver promises? I can’t tell where it falls. This defect will probably be a major headache for Virgin Galactic. That’s funny, my Google alerts aren’t yet reporting the Sunday Times Story! There’s a distinct smell of rodent. Damn this rocket business is tricky! I can’t find it via Bing, either. Might be less of a conspiracy than a dislike of pay walls by the search engines. Just what we needed… another terrible setback… along with denials from the ones who should safely, transparently be able to carry actual paying customers to space. At this point it’s almost a “probably not going to happen”. When VG attempt to stuff something this concerning… keeping up this attitutde they’ll get somebody killed. Yeah, one gets the sense that it’s all marketing to the decision makers at VG. They are setting a bad image for the fledgling industry. In bonding of composite/adhesives, some specific types of cracks are deem acceptable, and will not propagate with repeat loading. With no pic, hard to say. Sometimes the technician leaves too much glue at the end of a joint, it will show a crack after thermal or mechanical loading, but the crack will not propagate into the joint itself.